Sleek 18ct White gold is the perfect match for oval cut sapphires teamed with sparkling brilliant cut diamonds in this lovely design. Crafted as an everlasting token of your love, this stunning ring will take their breath away. 18ct White Gold Sapphire and Diamond Eternity Ring is rated 5.0 out of 5 by 1. Rated 5 out of 5 by Anonymous from Gorgeous ring I saw this in the shop when looking for a special ring, and fell in love with it straight away. 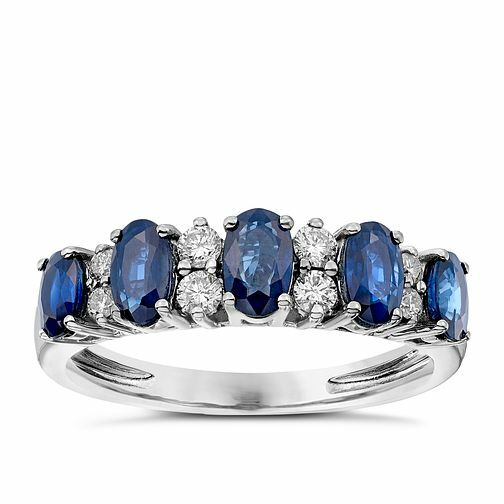 The oval sapphires make it very striking and the combination with the diamonds is beautiful.